The TOPSKY gaming chair is a solid choice for gamers who need a quality gaming at a reasonable price. It’s got the many features that gamers love, and it is up to par with several name brand gaming chairs. The TOPSKY gaming chair is unique, very cool looking and overall a great choice of gaming chair. Want to see some other sweet gaming chairs? Be sure to check out the 18 best computer gaming chair picks for this year. In fact, the TOPSKY gaming chair is one of our team favorites for a number of reasons. Before we jump into those reasons, we want to share with you why we decided to write this review and any other review on this site. Our team is dedicated to finding the best computer chairs – whether for gaming, working or maximum comfort. In this case, there are endless amounts of gaming chairs on the market; our goal is to save you time and energy by sitting in and reviewing the best of the best. We simply want you do what you really came here to do: find a chair quickly so you can get back to gaming. Who needs to spend hours researching chairs in the first place? Not you. You have more important things to do like kill zombies and destroy your enemies. Right off the bat, one of the most noticeable features of this gaming chair are the clean lines and sleek design. Some racing style gaming chairs have the tendency to look “over the top” in our opinion, but not the TOPSKY model. It’s constructed from fine PU leather which is fitted over a thick, cushy padding; it makes for quite the comfortable sitting experience. Rest assured that you’ll be able to game for hours on end in this gaming chair in plenty of comfort. The red and black version looks pretty mean and intimidating. If that’s what you’re into, it’s a no-brainer here. Bottom line, this a great looking chair, if not one of the best looking gaming chairs out there. The materials and are definitely up to par with the most premium brands of racing style gaming chairs, and it comes in a few different color options that are all unique and stylish. As mentioned before, this gaming computer chair is made from top quality PU leather that is fitted over plush, intelligently placed foam padding. There are a lot of other features the TOPSKY gaming chair has to offer that make it a true stand-out gaming chair. Let’s start with the padding placement. The first thing to note is the armrests are padded and have PU leather covers on them. This is an often overlooked feature and is critical to a comfortable gaming experience. On top of that, the armrests are adjustable and can be set in place to match your preferred armrest height. Next, let’s talk about the lumbar and headrest support. On this chair, there’s a removable lumbar support pillow that will help ensure a proper posture while gaming hours on end. Don’t like the feel of it? No problem. Pop it off and toss it in the corner. The integrated headrest is a nice feature too – it will make sure your neck and upper back are properly supported. Plus, there’s a aeration system at work right below the headrest support. See the hole in the upper middle of the chair? That’s definitely on purpose, and it increases the airflow to your back and neck making for a cooler sitting experience. The last thing we will note in this section is the height, tilt and reclining capabilities. Like most standard gaming chairs, the height can be adjusted up and down. Additionally, you can adjust the tilt and tilt tension to your liking. Aside from those two features, one of the nicer functions of the TOPSKY gaming chair is its ability to recline up to 175 degrees. Waiting for the next round of team death match to start? No problem. Recline back and watch in maximum comfort. The reclining capability coupled with the retractable leg rest make this chair more than just a gaming chair. It transforms your computer station into a full on entertainment hub. Think of all the Netflix binge opportunities in your new reclining TOPSKY gaming chair. 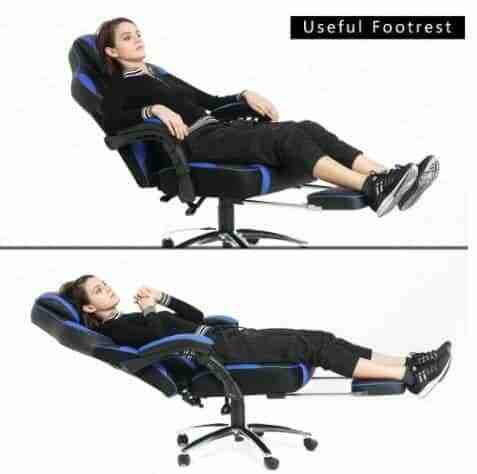 It may seem silly to some, but we simply love the foot rest feature in the TOPSKY gaming chair. So much so that it deserved a whole section in this review. I mean really – what more could you ask for? On top of the TOPSKY computer gaming chairs superior comfort, style and ergonomic design, they put a freaking leg rest on it. The leg rest + 175 degree reclining seat = one hell of a combo for a gaming chair. Make sure you keep a blanket handy when you’re gaming in this bad boy because you can now take naps right at your computer. All jokes aside, this is a really cool feature and it’s one more reason that this is a superior PC gaming chair. Did we mention it reclines and has a retractable footrest? There were common complaints about the height leaver breaking. HOWEVER, the manufacturers acknowledged this issue and now use more sturdy parts. All in all, we give the TOPSKY gaming chair two thumbs up. We would give it three if we could. It’s an excellent chair and you’re definitely getting a bang for your buck with the TOPSKY. Plus, It has all of the most favorite features in a gaming chair and it comes in some pretty cool colors. The TOPSKY gaming chair is a must have for those who don’t care that much about name brand items and value quality over brand recognition.